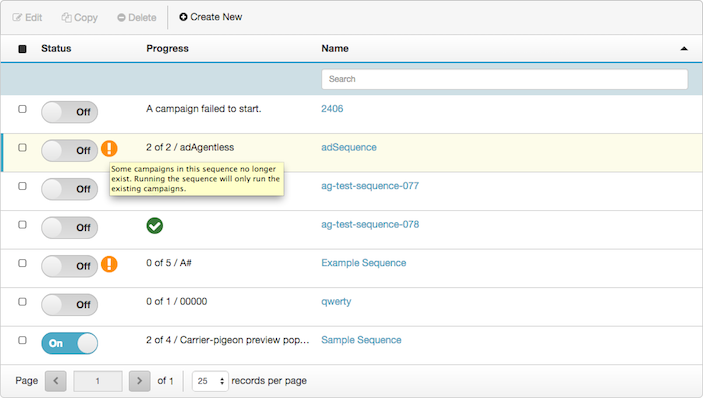 The sequences view allows an administrator to define a sequence of chained campaigns. Instead of starting and stopping campaigns one at a time, administrators start or stop the sequence. When using sequences, the next campaign starts dialing immediately when the previous campaign has attempted to dial all its contacts. Click the Name column. The caret in the Name heading indicates whether the column sorts in ascending or descending order. In addition, you can filter what is listed by typing all or part of a name in the Search box.